We had chorus this morning and it was a very good rehearsal. In a couple of weeks we will perform at the college. We did it last year too and I was very impressed. The event is based on gratitude and they collect all kinds of food and supplies for the food shelf. My drumming pals will probably be playing too. After lunch I dragged myself to Agape. It has been a week since my last visit and I sure knew it. Hit the bank and Weggies on the way home. Gary has a very bad cold and spent the afternoon snoozing. I decided to make us a comfort food dinner. First I sauteed an onion with a long, sweet red pepper. Then I had to go out and do chores. Decided to soak Berlin in the regular barn as I did not want to have her walk through the mud to get to her stall. Used a small bucket and she stood like a champ. Once again Abbe rolled and was filthy. It was almost dark when I left the barn. Gary was out splitting wood so we could keep the fire going. Back to dinner....after the onion and peppers were nice and soft I threw in 1/3 of a pound of London Broil that I picked up at the Deli. Topped it with a round of provolone cheese and broiled it. You would have loved it. OK>>>OK>>>>so it's haaaalloooooweeeeeen. Nobody comes out here to nowheresville. 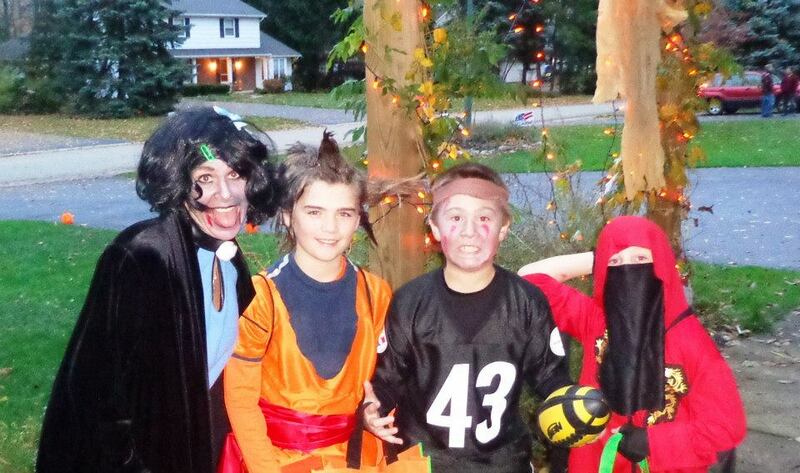 As I write this, Jenny, Joey M., Finn and Coop are out trick or treating in their neighborhood. Aren't they beautiful? regarding the recent visit from Sandy. We were so lucky. I'm hoping the power comes on real soon for Victoria (Teachings of the Horse). Last night the weather started getting bad around 5pm when I put the horses in....rain and heavy winds. At 12:15am Carol and Topper arrived, as the sheriff knocked on their door and said there was a mandatory evacuation for people in Monroe County who lived on the lake. We were all tired and I managed to fall asleep around 1am....did not wake up until 7. Boy did we luck out. Did not lose power. This morning the ground was covered with many branches and the front paddock had shingles here and there that had blown off the barns. So far, that was it. I've been trying to upload some photos, but it won't work. Will try again later. Hope all of you are safe and dry. A grey morning that turned into a couple hours of sunshine. If we get much more rain, it's going to reach the front paddock from the outdoor ring. Gary had to put some fence boards back up. Fortunately the girls were able to get out in the pasture. (By evening, a lot of the water disappeared). When chores were finished, Carol and Topper took us out for breakfast before they went back out to the lake. After we ate, Gary went down to Jen's to watch the boys and I started picking up sticks. I was so sleepy this afternoon...vegged by the fire. Then I worked on dinner. First I put some chicken stock in a big pot. Added cauliflower, onions and carrots. When it was tender, I put in in a casserole and covered it with a cheese sauce. Heated it through in the oven and then garnished with hard boiled eggs before serving. The afternoon was not as bright as the morning. Had a little more rain. Tucked in the girls a little before six. Gucci and Phoebe took over my spot on he couch. Thank you blogging friends, for keeping track of us. Hope you are all ok. If I don't add anything to this post, it means the power went out. Hope all of you are safe and sound. It is a little after 7:15 and we still have power. The storm is moving faster than it was supposed to and is really slamming the East Coast. Just got off the phone with a friend who lives on the shore of Lake Ontario and things are getting progressively worse....the wind is shaking their windows and pushing water in around the edges. We are nowhere near what is supposed to be coming our way. The day was relatively quiet until about 5. Rain off and on. Now it is pouring and things are kicking up. Will "fly" out to the barn later to check on the horses. Sidney is no dummy... spent some time in the house today (tonight I think he is in the barn with the horses). This morning it was raining of course. When I finished cleaning stalls the girls joined me in the grooming room. I love it, they come in when I call them. No halters, no nothing. You must know the drill by now. Abbe would flip if I didn't let her come in with us. A lot different with just 2 horses. They both get some grooming out of the deal. This part of the barn has a "people" door and a sliding door off the back. Over the years, all of our horses have had no problem using either. Afterward they went over to the run-in by their stalls and chowed down...not much pasture time today. I made one last trip to the store, did laundry, changed the sheets and took a shower. Had no idea when the power would go off. Earlier today I filled up an extra water trough and buckets so we are covered for a few days. Being on a well presents some serious problems. Abbe and Berlin went in a little early. I hope that 24 hours from now Sandy will have passed us by. How many times has Manhattan been deserted? Hope all is well with my blogging buddies and friends around the country. MAKE SURE YOU HUG A SHEEP TOMORROW! HOW DOES 82 DEGREES SOUND? SUNDAY STILLS CHALLENGE - WHAT INSPIRES ME? WHO WAS DRIVING MR. SANDMAN IN CHRISTINA'S WORLD?